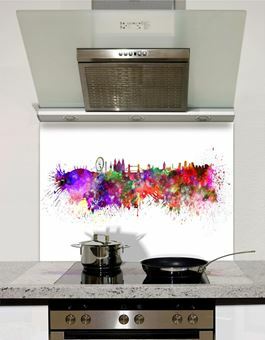 Our digitally printed Watercolour London abstract Splashback is made from toughened glass that has been cut to your specification before being produced. Can be shaped to fit under practically any cooker hood. This custom made splashback is heat resistant to over 400C. Provides protection from splashing grease when cooking and is easy to clean. Manufactured to be UV resistant so it doesn't fade in normal conditions. 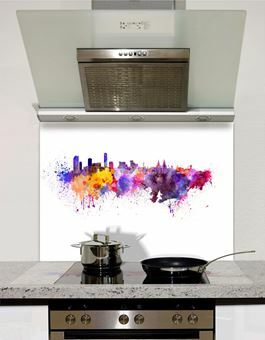 Our digitally printed Watercolour New York skyline Splashback is made from toughened glass that has been cut to your specification before being produced. Can be shaped to fit under practically any cooker hood. This custom made splashback is heat resistant to over 400C. Provides protection from splashing grease when cooking and is easy to clean. Manufactured to be UV resistant so it doesn't fade in normal conditions. 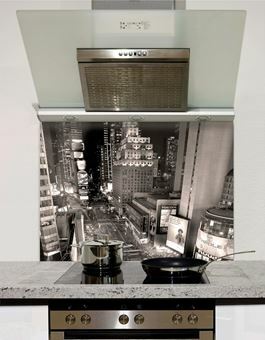 Our digitally printed Manhattan Midtown at Night Splashback is made from toughened glass that has been cut to your specification before being produced. Can be shaped to fit under practically any cooker hood. This custom made splashback is heat resistant to over 400C. Provides protection from splashing grease when cooking and is easy to clean. Manufactured to be UV resistant so it doesn't fade in normal conditions. 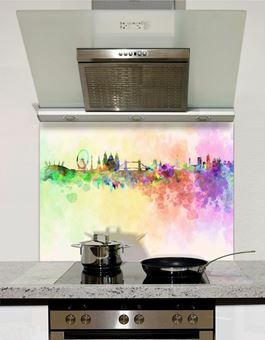 Our digitally printed Watercolour London Splashback is made from toughened glass that has been cut to your specification before being produced. Can be shaped to fit under practically any cooker hood. This custom made splashback is heat resistant to over 400C. Provides protection from splashing grease when cooking and is easy to clean. Manufactured to be UV resistant so it doesn't fade in normal conditions. 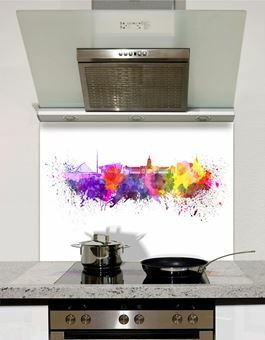 Our digitally printed Watercolour Glasgow Splashback is made from toughened glass that has been cut to your specification before being produced. Can be shaped to fit under practically any cooker hood. This custom made splashback is heat resistant to over 400C. Provides protection from splashing grease when cooking and is easy to clean. Manufactured to be UV resistant so it doesn't fade in normal conditions. 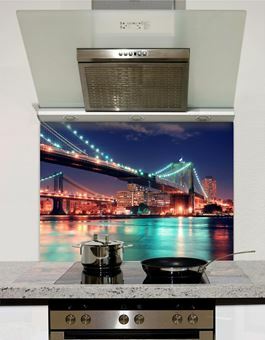 Our digitally printed New York downtown at night Splashback is made from toughened glass that has been cut to your specification before being produced. Can be shaped to fit under practically any cooker hood. This custom made splashback is heat resistant to over 400C. Provides protection from splashing grease when cooking and is easy to clean. Manufactured to be UV resistant so it doesn't fade in normal conditions. 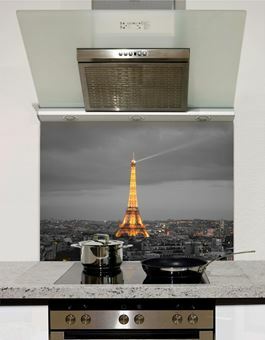 Our digitally printed Paris At Night Splashback is made from toughened glass that has been cut to your specification before being produced. Can be shaped to fit under practically any cooker hood. This custom made splashback is heat resistant to over 400C. Provides protection from splashing grease when cooking and is easy to clean. Manufactured to be UV resistant so it doesn't fade in normal conditions. Our digitally printed Watercolour York Splashback is made from toughened glass that has been cut to your specification before being produced. Can be shaped to fit under practically any cooker hood. This custom made splashback is heat resistant to over 400C. Provides protection from splashing grease when cooking and is easy to clean. Manufactured to be UV resistant so it doesn't fade in normal conditions. 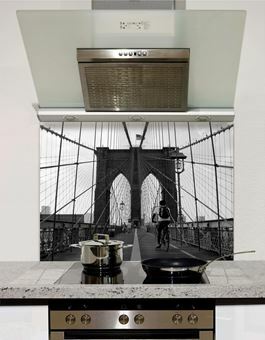 Our digitally printed Brooklyn Bridge Splashback is made from toughened glass that has been cut to your specification before being produced. Can be shaped to fit under practically any cooker hood. This custom made splashback is heat resistant to over 400C. Provides protection from splashing grease when cooking and is easy to clean. Manufactured to be UV resistant so it doesn't fade in normal conditions. 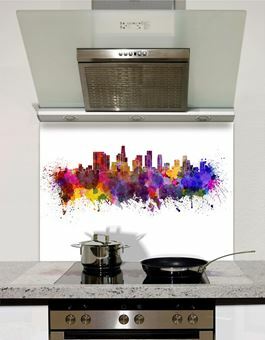 Our digitally printed Manhattan Splashback is made from toughened glass that has been cut to your specification before being produced. Can be shaped to fit under practically any cooker hood. This custom made splashback is heat resistant to over 400C. Provides protection from splashing grease when cooking and is easy to clean. Manufactured to be UV resistant so it doesn't fade in normal conditions. 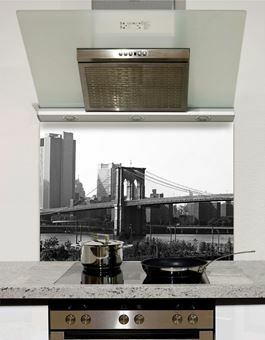 Our digitally printed Brooklyn Bridge Greyscale Splashback is made from toughened glass that has been cut to your specification before being produced. Can be shaped to fit under practically any cooker hood. This custom made splashback is heat resistant to over 400C. Provides protection from splashing grease when cooking and is easy to clean. Manufactured to be UV resistant so it doesn't fade in normal conditions. 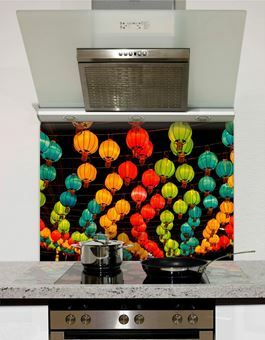 Our digitally printed Chinese New Year in Chinatown Thailand Splashback is made from toughened glass that has been cut to your specification before being produced. Can be shaped to fit under practically any cooker hood. This custom made splashback is heat resistant to over 400C. Provides protection from splashing grease when cooking and is easy to clean. Manufactured to be UV resistant so it doesn't fade in normal conditions. 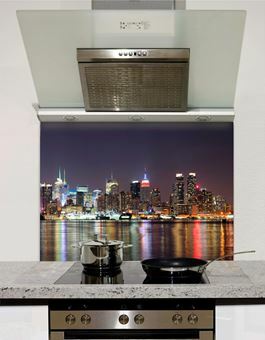 Our digitally printed NYC Skyline Splashback is made from toughened glass that has been cut to your specification before being produced. Can be shaped to fit under practically any cooker hood. This custom made splashback is heat resistant to over 400C. Provides protection from splashing grease when cooking and is easy to clean. Manufactured to be UV resistant so it doesn't fade in normal conditions. 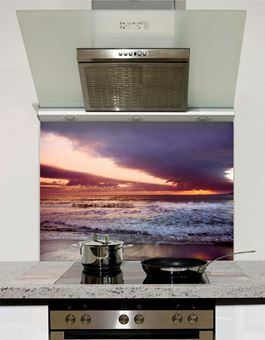 Our digitally printed Sunset Beach Splashback is made from toughened glass that has been cut to your specification before being produced. Can be shaped to fit under practically any cooker hood. This custom made splashback is heat resistant to over 400C. Provides protection from splashing grease when cooking and is easy to clean. Manufactured to be UV resistant so it doesn't fade in normal conditions. 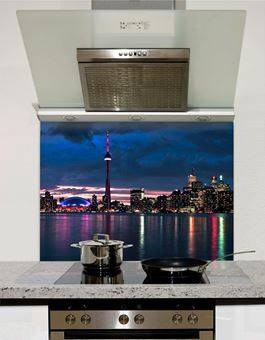 Our digitally printed Toronto skyline Splashback is made from toughened glass that has been cut to your specification before being produced. Can be shaped to fit under practically any cooker hood. This custom made splashback is heat resistant to over 400C. Provides protection from splashing grease when cooking and is easy to clean. Manufactured to be UV resistant so it doesn't fade in normal conditions. Our digitally printed Watercolour Belfast Splashback is made from toughened glass that has been cut to your specification before being produced. Can be shaped to fit under practically any cooker hood. This custom made splashback is heat resistant to over 400C. Provides protection from splashing grease when cooking and is easy to clean. Manufactured to be UV resistant so it doesn't fade in normal conditions. Our digitally printed Watercolour Coventry Splashback is made from toughened glass that has been cut to your specification before being produced. Can be shaped to fit under practically any cooker hood. This custom made splashback is heat resistant to over 400C. Provides protection from splashing grease when cooking and is easy to clean. Manufactured to be UV resistant so it doesn't fade in normal conditions. 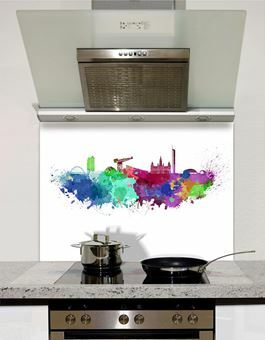 Our digitally printed Watercolour Dublin Splashback is made from toughened glass that has been cut to your specification before being produced. Can be shaped to fit under practically any cooker hood. This custom made splashback is heat resistant to over 400C. Provides protection from splashing grease when cooking and is easy to clean. Manufactured to be UV resistant so it doesn't fade in normal conditions. 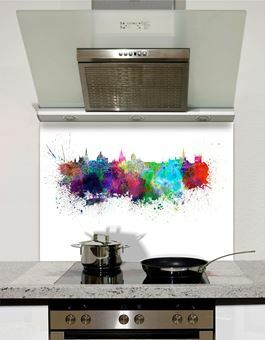 Our digitally printed Watercolour Edinburgh Splashback is made from toughened glass that has been cut to your specification before being produced. Can be shaped to fit under practically any cooker hood. This custom made splashback is heat resistant to over 400C. Provides protection from splashing grease when cooking and is easy to clean. Manufactured to be UV resistant so it doesn't fade in normal conditions. Our digitally printed Watercolour Las Vegas Splashback is made from toughened glass that has been cut to your specification before being produced. Can be shaped to fit under practically any cooker hood. This custom made splashback is heat resistant to over 400C. Provides protection from splashing grease when cooking and is easy to clean. Manufactured to be UV resistant so it doesn't fade in normal conditions. Our digitally printed Watercolour liverpool Splashback is made from toughened glass that has been cut to your specification before being produced. Can be shaped to fit under practically any cooker hood. This custom made splashback is heat resistant to over 400C. Provides protection from splashing grease when cooking and is easy to clean. Manufactured to be UV resistant so it doesn't fade in normal conditions. 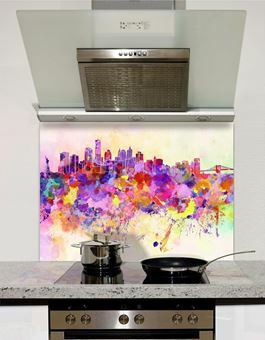 Our digitally printed Watercolour Los Angeles Splashback is made from toughened glass that has been cut to your specification before being produced. Can be shaped to fit under practically any cooker hood. This custom made splashback is heat resistant to over 400C. Provides protection from splashing grease when cooking and is easy to clean. Manufactured to be UV resistant so it doesn't fade in normal conditions. 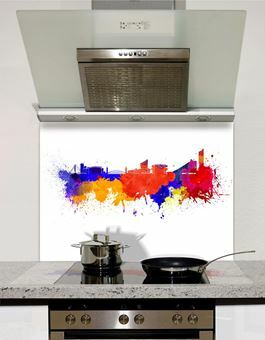 Our digitally printed Watercolour Manchester Splashback is made from toughened glass that has been cut to your specification before being produced. Can be shaped to fit under practically any cooker hood. This custom made splashback is heat resistant to over 400C. Provides protection from splashing grease when cooking and is easy to clean. Manufactured to be UV resistant so it doesn't fade in normal conditions. 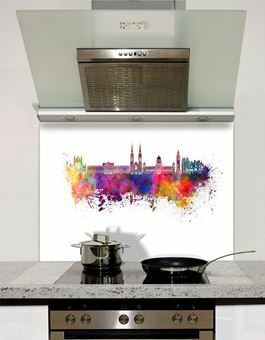 Our digitally printed Watercolour Oxford Splashback is made from toughened glass that has been cut to your specification before being produced. Can be shaped to fit under practically any cooker hood. This custom made splashback is heat resistant to over 400C. Provides protection from splashing grease when cooking and is easy to clean. Manufactured to be UV resistant so it doesn't fade in normal conditions.